1. Using a grater or food processor equipped with a grating blade, grate the potatoes, celeriac root, apple and onion. 2. Put the grated foods together in a mesh strainer or tea towel and squeeze out all the liquid. Once drained, put in a bowl. 3. Add the egg, breadcrumbs, Panko, or flour, thyme or marjoram and sprinkle with salt and pepper to taste. If necessary, add a little more breadcrumbs, Panko or flour so the mixture holds together. 4. Heat a griddle or large, 12-inch non-stick pan and coat with 1/8 inch of oil. 5. Take about 3 tablespoons of the potato mixture in the palm of your hand and flatten into a circle, about 3-inches in diameter. 6. Carefully slide the latke into the oil. Repeat with about 3 at a time separated by an inch or so. Using a spatula, press to flatten the latkes and fry for about 5 minutes on one side or until golden. Flip the latke and cook for another couple of minutes until golden on the other side. 7. Remove the latke and drain on a paper towel. Serve immediately with garnishes of your liking. Tip: To make crispy latkes, remove as much liquid as possible from the grated potatoes, onions, celeriac, and apple. Be sure to fry the latkes in hot, but not smoking, oil. 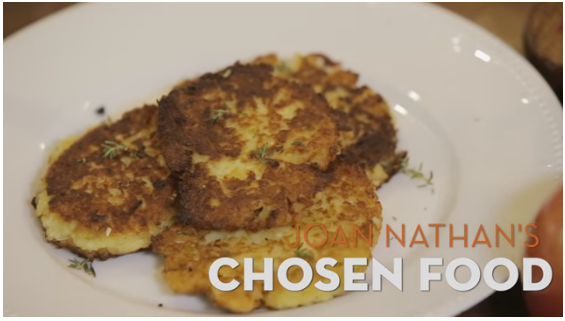 I try to use as little breadcrumbs as possible and test a few latkes to see if they stay together before cooking the rest.